Mr. Sota Hida (Electromagnetic Energy Application Laboratory), a first-year student on Information and Electronics Course, received the Award for NIMS Internship Program 2017 from the National Institute for Materials Science and Technology. This program recruits visiting researchers from all over the world, and participants can receive gifted education to become engineers or researchers through the use of laboratory research facilities and exchange with leading researchers. 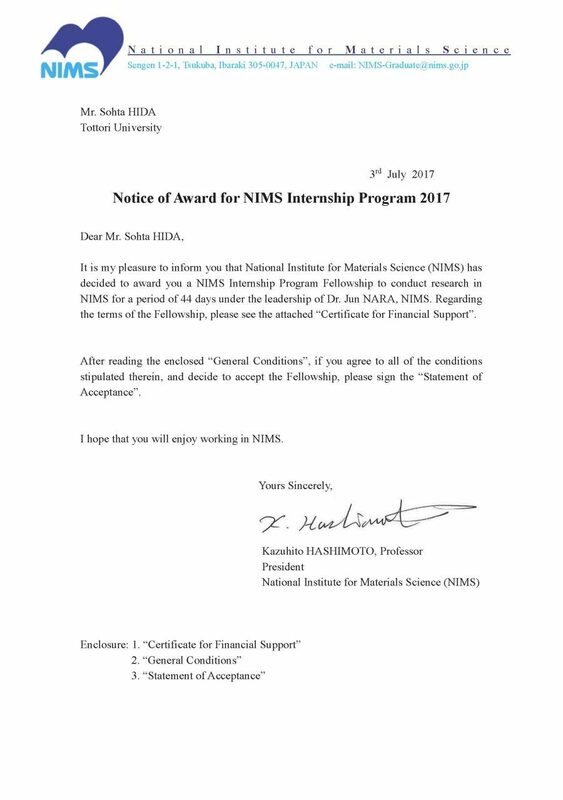 Award for NIMS Internship Program 2017 is an award given especially to excellent people among program participants, and recipient Mr. Sota Heda will receive financial support over the research period of 44 days.